A new artwork is being made by the World Dirt Association (James Jack, Yoshitaka Nanjo and Shotaro Yoshino) for the Land and Water Art Festival which will open in Niigata Prefecture during July 2015. 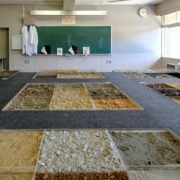 This artwork is being created through the collection, cataloging and display of 100+ dirt samples from across the world. The main goal of “Dirt Stage: 土の時間を育てる” artwork is to find creative ways of representing the life of dirt.